Use the following guide to help plan and facilitate your next agile sketching session. Before we get started we’ll need to identify some inputs. Inputs are data that inform the sketching process. They can include a product vision, assumption personas of intended users, and specific scenarios where they might use the product or feature. Using individual sticky notes, write as many possible scenarios where a person would experience product or feature. 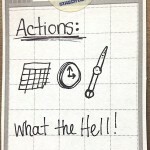 Using separate sticky notes, write down possible functionality the product or feature should have to enhance the experience of your scenarios. Now imagine the person in your scenario – using a separate your sticky note, write a brief description; age, gender, job title and interests. Focus on the ideas. It’s not about bad or good, it’s about Can you see it? Can you understand it? Using boxes, arrows, callouts, and common metaphors, anyone can communicate an idea with pen and paper. Using blank paper, explore as many ideas as possible. This phase is about ideas and exploration so try to force your self to come up with as many ideas as possible. Don’t stop at the first one. If you get stuck, list ideas as words, then try different combinations of words to inspire different ideas. Sketch those ideas on new paper. Another technique is to explore opposites. If one idea is a richly animated experience, explore static two-dimensional options. Now that we have created lots of ideas, let’s explore how these ideas work together. Next, using scissors and drafting dots we’ll cut up and add our ideas and add them to the wall. With a shared understanding of what we’re looking at, we’ll group similar ideas. The team will move things around as necessary. Next, we’ll label the groupings. It’s good to use sticky notes here so we can move them around as needed. Critique is about critical thinking. Effective critique is selfless. The goal of critique is to gather initial thoughts and reactions, to better understand the thinking behind an idea. The goal is to collect and display as much of the feedback, notes, questions, comments, as possible within the context of the design. Now that we have collected and organized notes, comments, and sketches, the results need to be captured. Review overall comments – black hat notes. Rick Butler is a User Experience Architect and Agile UX Specialist with over 12 years of experience in Human Factors Engineering. Rick has worked with corporations across a variety of industries including marketing and promotion, e-commerce, publishing, local search and interactive advertising. Rick is a graduate of SUNY New Paltz with a Bachelor of Science in Visual Arts and a Certified Usability Analyst from Human Factors International. Rick specializes in UX strategy and integration with agile organizations. His expertise includes user research, facilitating collaborative design, concept development, prototyping, and user testing and product development.